Nursery seating has been taken to a whole new level! This contemporary recliner, part of our Next Generation Recliner series, is very streamlined with its straight lines and screaming curves. 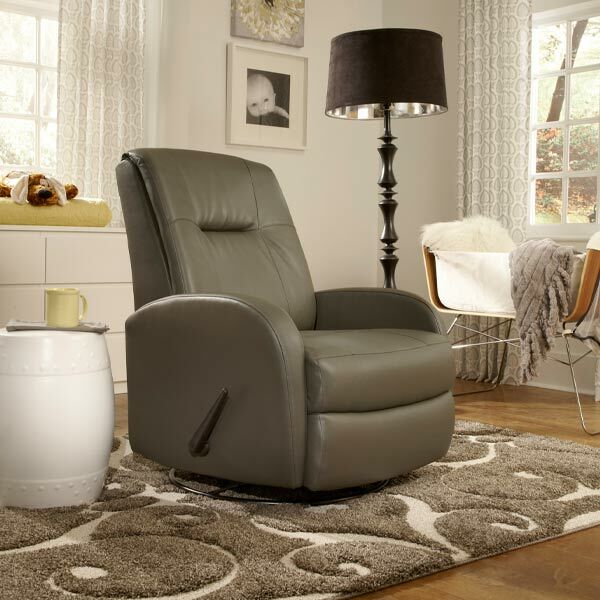 Shown as a swivel glider recliner with a reclining handle, this recliner is also available as a Power Rocking Recliner or a Power Swivel Glider and features new age metallic buttons that allow you to recline at the touch. Unit Weight (lbs) Seat Width 22.5"
Unit Width 31.25" Arm Height 21 7/8"
Unit Height 39.25" Seat Depth 20 5/8"
Unit Depth 35" Seat Height 17.75"
Other options available, Stop in or Contact Us for more information on prices and options! The perfect mix of comfort and style for your little one's new nursery! Over 100 fabric/color options in Hello Baby store. The best for baby. Lehigh Valley, PA baby store for exclusive baby furniture, affordable clothing and unique gifts.